i hope finish this soon. hi majid. 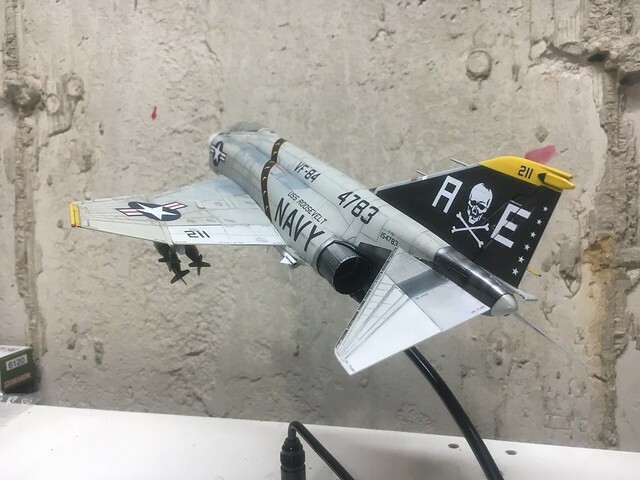 nice work on that corsair. i like your work on the engine. thought you might like to know though, if you want to be accurate the landing gear and bay should be white unless your doing an overall gloss sea blue. and then i'm not sure but they may be blue also. 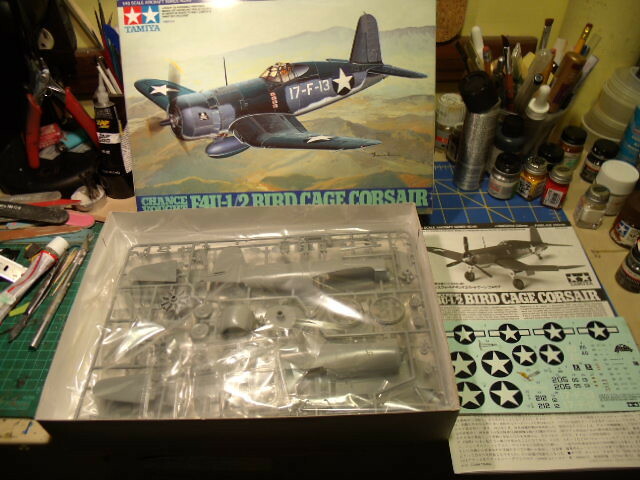 i'm doing a birdcage corsair, got the white down having trouble nailing down the correct blues. which paints are you planing on using? Pictures in the gallery will be changed now. Good idea but I've always had a hard time myself with a good finish. In this experiment, I used two canopy's and two different processes to achieve a 'LOOK'. 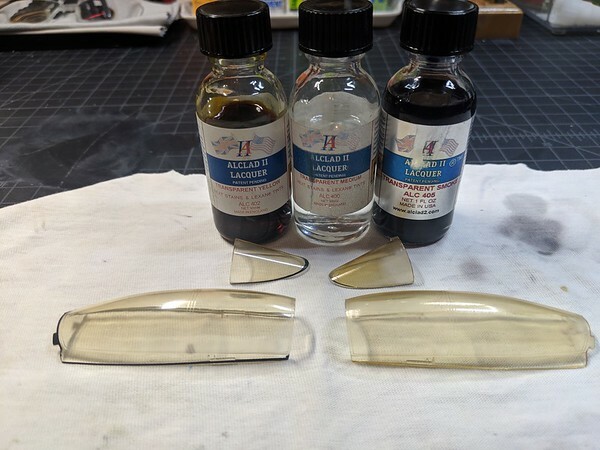 My colors of choice are these 3 Alclad Transparent: Yellow, Smoke, Clear Medium and Tamiya Lacquer Thinner. I can't give an exact recipe here because it's a personal preference (eye) and some continual mixing of transparents... But for me, I continually mixed ratio's with each other color to get an acceptable 'Tint'. Then when that was done, I cut the final color with a 60% thinner to 40% color ratio to airbrush on. On the Right, same color with not as much thinning and applying the tint on the 'outside' of canopy. In my eye, the left canopy process is my winner!! This process was easier, coats were applied long ways and in the end, because the exterior surface of the canopy was first polished with 'novus scratch remover', it gives off a smooth sheen finish in the end. Looking great Majid with the added detail and regardless of the kit issues! I'm looking forward to seeing more as you proceed. Couple of good looking Phantoms there! It's gonna be close, but I'm not giving up! I'm sure it will recover nicely though! I ran into several (probably self induced) issues as I started the build so I thought I'd save all the fancy cockpit items for a later build since I have another exact kit and just build it and try new stuff. So it's back to the bench, remove them and clean up the mess! Then new photos will be put into the gallery, too. here is my finished build for this really interesting campaign. Many fine builds here and still some on their way to the campaign gallery, keep going! pasi looking good so far-looking forward to seeing it finished.your going to make the deadline, don't know if i will. here's where i am at with my f4-U birdcage. giving it a shot on painting the pilot. looks ok from this photo but up close a little rough. can't seem to get a good system for doing faces. Different carrier (USS Independence) and plane (1492). This is the first campaign that I have participated in and enjoyed being part of it and watching other builds. With that said mine has finally been completed. I have Learned much and tested new techniques as I've gone along. ok well better late than never. i'm going to give it a shot and see if i can make the deadline. Carlos: I like Your work very much! This is another jolly part of this campaign. Congrats ! Nice Thomas! 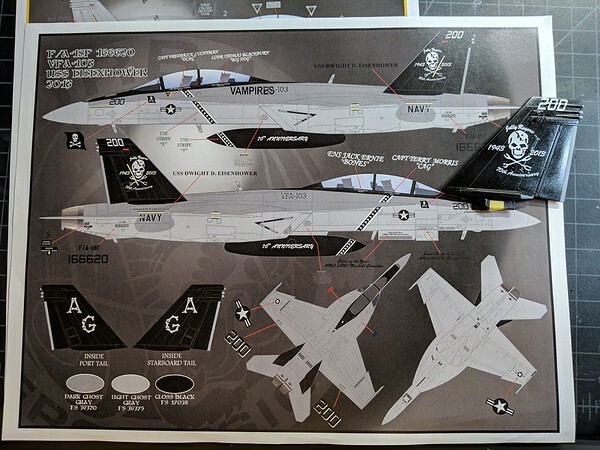 I plan on using that very sheet to do the 75th anniversary markings on a 1/48 F/A-18F in the 4th Gen. campaign. Can't get enough of them bones! Great work David and Carlos! From here your models look the bomb indeed! 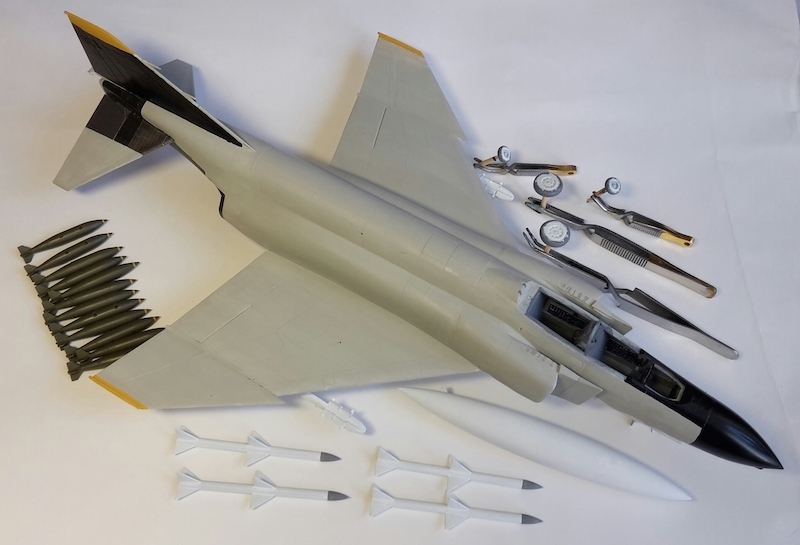 Slow progress is being made on the 1/48 Tamiya F-14A. The bottom is white, so that's something! 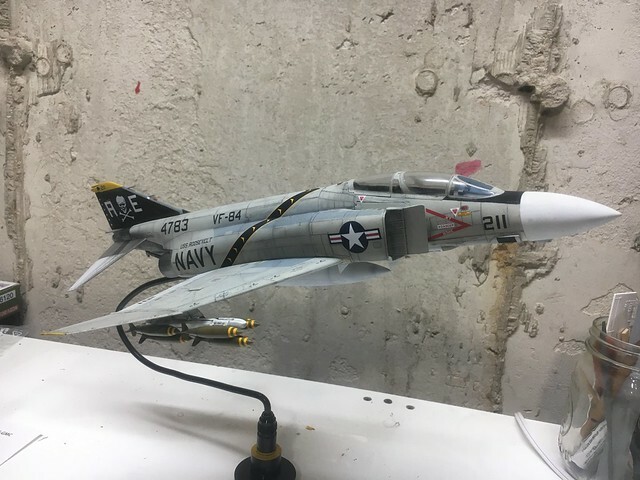 I am going to put my F-14B in the shelf. It is full of small mistakes but it is without doubt my best model. Working with you makes me go a bit further, thanks. Brian: Excellent work! I like Your built of the Cougar very much! 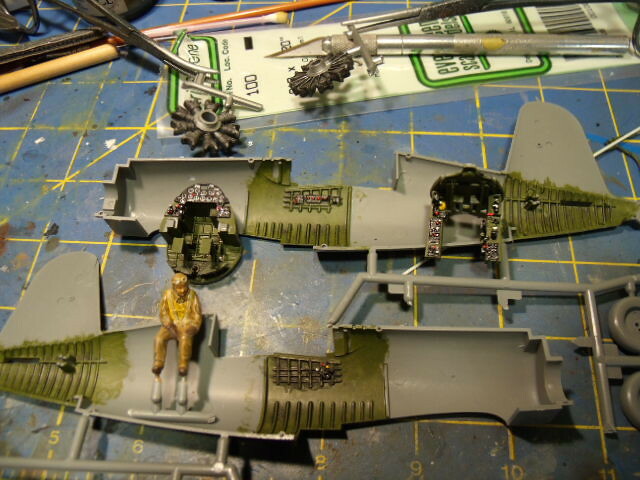 David: Great work on Your Hornet too! It looks really cool! Tim: Nice choice with this bearcat. I guess I have built 2 or 3 of them as a kid! David, it looks great. Congratulations. Love your load out !!!!!!! Whatever the problems, it looks like you won the fight... your Hornet (including the markings) looks just right!